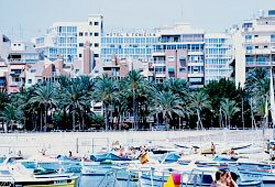 The Magic Fenicia Hotel is situated just 50 yards from Poniente Beach and 750 yards from the Levante Beach. Facilities at the hotel include a terrace, sun terrace, swimming pool, indoor pool that is heated during the winter season, sauna, jacuzzi, gym and various games such as table tennis and pool. The hotel has a varied night time entertainment programme with cabaret, games and shows for guests to enjoy.